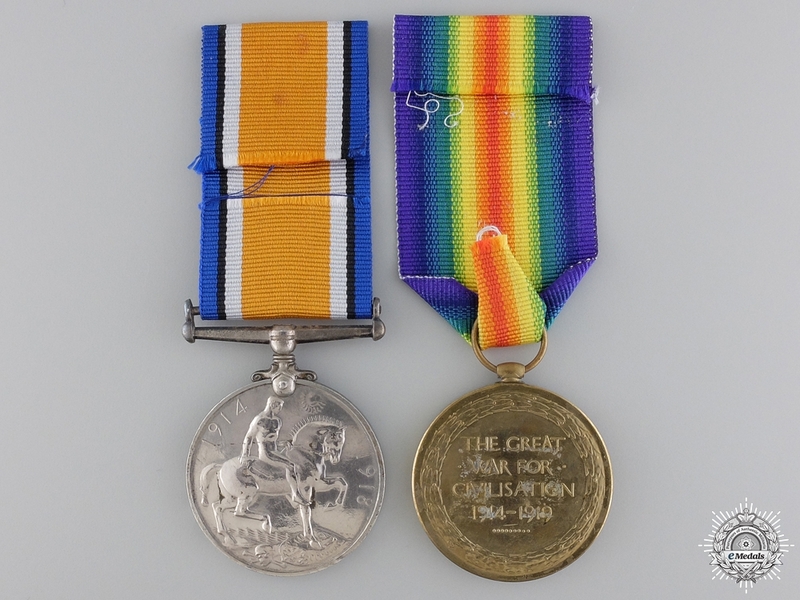 A Medal Pair to Lt.Soubly who was Wounded at Frezenberg - British War Medal (LIEUT E. SOULBY. ); and Victory Medal (LIEUT. E. SOULBY.). Naming is officially impressed. Plated, BWM experiencing plating wear, contact marks, better than very fine. Accompanied by a CD containing twenty-three pages with copies of his Index Cards, Attestation Paper, Service Records, Medical Records, Discharge Certificate and Certificate of Service. Footnote: Edwin Soulby was born on August 24, 1890 in Liverpool, Lancashire, England. He originally attested with the 34th Fort Garry Horse on November 9, 1914 and was stuck off strength on the 30th. He re-attested the following month, this time signing his Attestation Paper on December 24, 1914 at Winnipeg, Manitoba with the 32nd Battalion "Manitoba and Saskatchewan Regiment", naming his next-of-kin as his mother, Mrs. E. Soulby of Folkestone (later Liverpool), that he had no previous military service, that he was not married and that his trade was that of Advertising Solicitor. He was later to marry Doris Marjorie Soulby, of Folkestone, Kent on December 15, 1915, while in England. After attesting, he was posted to the 500 Draft, Princess Patricia's Canadian Light Infantry Reinforcements at Winnipeg and assigned 51445. He embarked for England on January 20, 1915 and was posted to Tidworth. He entered the French theatre on February 23rd, joining the PPCLI Battalion in the field on March 1st. 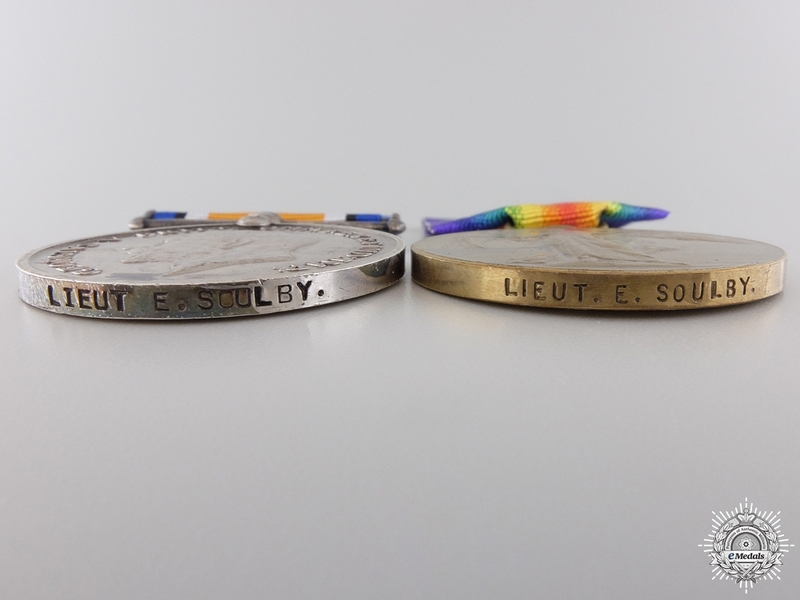 Soulby was wounded in action on the first day of the Battle of Frezenberg on May 8, 1915, with shrapnel in the left shoulder. The Battle of Frezenberg was part of the Second Battle of Ypres. The Germans had moved their artillery forward and put three Army corps opposite the 27th and 28th divisions on the Frezenberg ridge. The battle began on May 8th with a bombardment that disrupted the 83rd Brigade holding trenches on the forward side of the ridge but the first and second assaults by German infantry were repelled by the survivors. The third German assault of the morning pushed the defenders back. While the neighbouring 80th Brigade stopped the advance, the 84th Brigade was broken giving a two mile gap in the line. A further advance was stopped through counterattacks and a night move by the 10th Brigade. To make matters worse, while lying in a trench near Bellewaarde Lake, Soulby had a tree fall on his back. He was invalided to England and admitted to Weir Red Cross Hospital at Balham, London S.W. on May 13th, and taken on strength of the Canadian Casualty Assembly Centre the next day. He was transferred to the 3rd London General Hospital at Wandsworth on May 26th, remaining there until he was discharged to furlough on June 5th. The hospital noted in their records that although he had experienced a "Shrapnel wound of (the) left shoulder. Later a tree fell across his back rendering him unconscious. ", that his "Wound healed. (with) No permanent disability." After recovering from his wounds, Soulby served in reinforcement organization in England, with a number of Battalions. He was on command at the Canadian Convalescent Depot and attached for duty at Bath on February 17, 1916, appointed Acting Sergeant while at the Depot in Bath on March 11th, before being transferred to the Canadian Casualty Assembly Centre at Folkestone on July 23rd, where he was part of the Administration Staff. He was subsequently commissioned as a Lieutenant, CEF on August 15th and posted to the General List for employment under D. of R. & O. On October 7, 1916. He ceased to be attached to the D. of R. & O. and was transferred to the 2nd Command Depot for the next four months, before being transferred to the 11th Reserve Battalion on January 31, 1917. He served as a Lieutenant in the 11th Reserve Battalion until March 14th, when he was taken on strength of the 22nd Reserve Battalion at Shoreham, then later transferred to the 23rd Reserve Battalion on May 11th. In his Proceedings of a Medical Board, dated August 4, 1917 at Shoreham, the Deputy Assistant Director Medical Services for Canadians noted that Soulby had recovered from his shoulder wound but that he "complains of shortness of breath upon least exertion; Dizziness and fainting spells." and that "Examination reveals a very rapid, irregular heart; very excitable, but no murmurs detected. He is very nervous." Five days later, he was transferred to the 1st Quebec Regimental Depot at Shoreham on August 9th, then shifted from the 1st QRD to the 23rd Reserve Battalion, before returning to the 1st QRD. He was struck off strength of the Overseas Military Forces of Canada at the 1st QRD, upon returning to Canada in early 1918. In his Medical History of an Invalid, dated April 12, 1918 at Winnipeg, the examiner noted his overall medical condition as "Moderate anaemic. Has headaches. Has occasional pain in back. Vision in both eyes 20/20. Can walk one mile slowly. Other systems normal. ", that although he "Was wounded in (his) left shoulder, and crushed by a tree. No disability (was) due to above wound." He estimated that the duration of disability was a "minimum period of 6 months", declared Soulby Category "E" (unfit for service in Categories A (general service), B (service abroad, not general service) and C (home service (Canada only)) and certified that this Officer "does not require treatment" and "should pass under his own control". He was struck off strength as being "medically unfit" and discharged at Winnipeg on April 24, 1918, retiring his commission. He was credited with having served in Canada, England and France with the PPCLI, 11th, 22nd, and 23rd Reserve Battalions and the 1st Quebec Regimental Depot, with three years overseas service, of which three months were in France and Belgium before he was wounded. 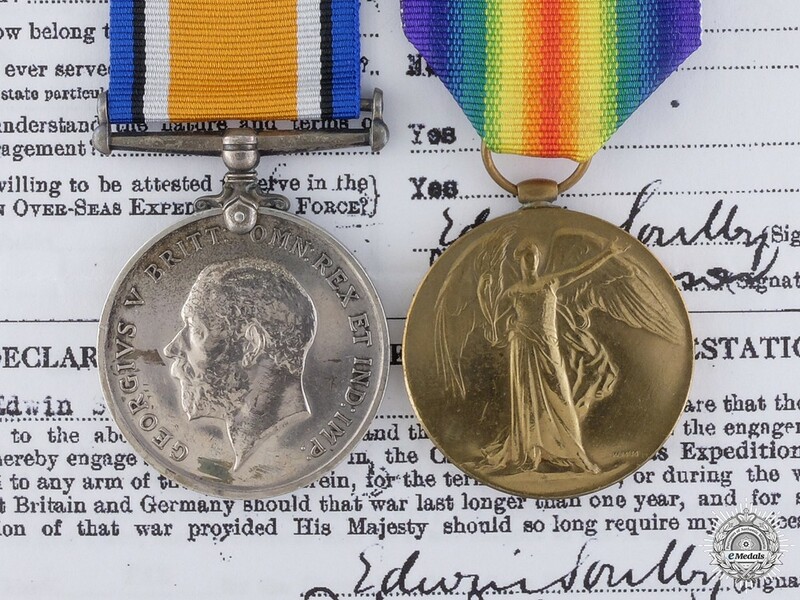 Eighteen months later, in the Fall of 1919, Soulby was examined for a pension, as he claimed he could no longer do his civilian job due to insomnia and other stress brought about from his war experiences. He was admitted to the Manitoba Military Hospital on September 24, 1919 for a full evaluation. It was noted on October 11th, that he was experiencing "Neurasthenia" (a mechanical weakness of the actual nerves). He claimed to be suffering from insomnia, an inability to concentrate, playing out readily on mental or physical activity and Dyspnea (shortness of breath) and palpitation on slight exertion. His records indicate his "hands (were) cold and clammy, face is flushed, pupils are small, his general physical condition is not good, muscles are soft and flabby. Skin shows "hyperhidrosis" (abnormally increased sweating/perspiration) and dermatographia" (in which the skin becomes raised and inflamed when stroked, scratched, rubbed, and sometimes even slapped). The examiner when on to state that "It would appear that this condition has prevailed with very little change since his return from France. ", that the Neurasthenia was "originally produced by emotional trauma in France, and now being kept up by domestic and business worries." An additional observation dated on October 15th, noted that "This officer has been carrying on some work in the Gym., but has not co-operated in treatment as he should. He has been drinking a great deal more than is good for him, and has done so since I told him a short time ago that he had better leave alcohol entirely alone. I have never seen evidence of his worries sitting very heavily on him, and it is my opinion that he would be much better off working for his living than doing next to nothing around hospital. He is therefore to be discharged from hospital. ", signed by the Captain of the Canadian Army Medical Corps at Winnipeg. In his handwritten Will, dated February 1, 1916, he stated "In the Event of my death I give the whole of my property & effects to my wife Doris Marjorie Soulby. Edwin Soulby 51445 P.P.C.L.I." Soulby died March 15, 1928 in Winnipeg, at the age of 37.